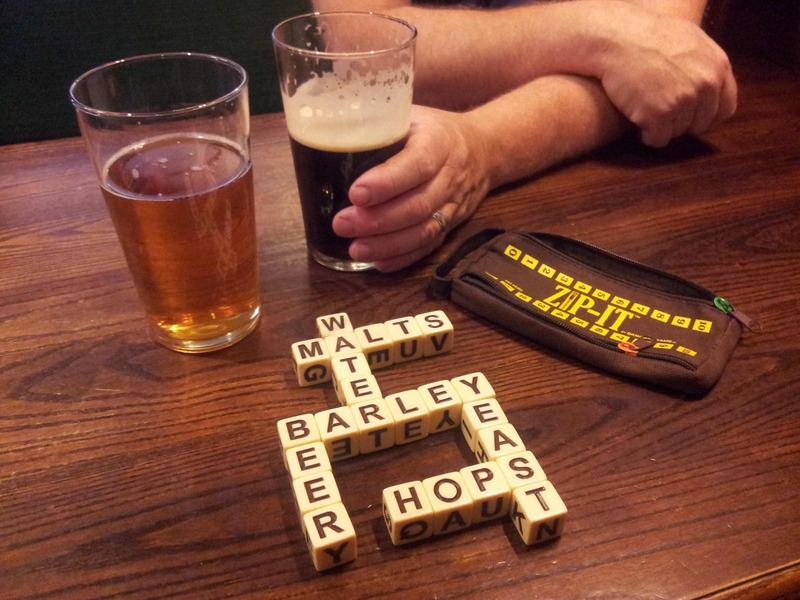 Every so often CAMRA does some sort of survey and then issues a press release about traditional pub games and the amount of people playing them. I used to turn my nose up a bit at this type of story because I mostly went to the pub to chat with my mates – and drink beer of course – but I discovered there’s a bit of a different dynamic when one goes to the pub with their partner, especially if you live with them. Hence Beer Husband and I developed the habit of taking the Chess board down the pub or competitively doing the Word Wheel Game from the newspaper. The trouble is I need a really clear head to play Chess (and often we go to the pub to flop and have something to eat on days when we are too tired to cook) and Word Wheel battles don’t last long enough. So when I got a press release about a word game called ‘Zip It’ that came in a pocket sized format and worked a little like Scrabble I was keen to try it. My review of the game follows below, but before that a few words about how great it is down the pub. Or to put it another way “It’s Better Down the Pub”, which is the name of a campaign which aims to get people to celebrate their local – or any pub they’ve had a brilliant time in and love going to. In a time when there’s lots of doom and gloom about pub closures and the way big pub companies (pubcos) treat their tenants resulting in poorly paid licensees and restricted beer choices it’s good to be able to support the people behind our best pubs by shouting about how much we love going down the pub. 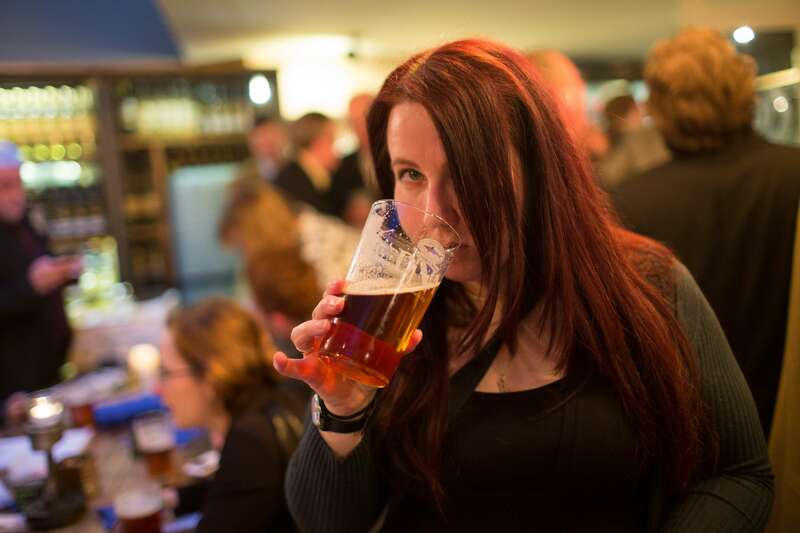 Have a look at the It’s Better Down the Pub website to see how to upload your photos, videos and stories celebrating the pubs you love – which is the essence of the campaign – getting pub-goers to speak up about all that’s great about the Great British boozer. 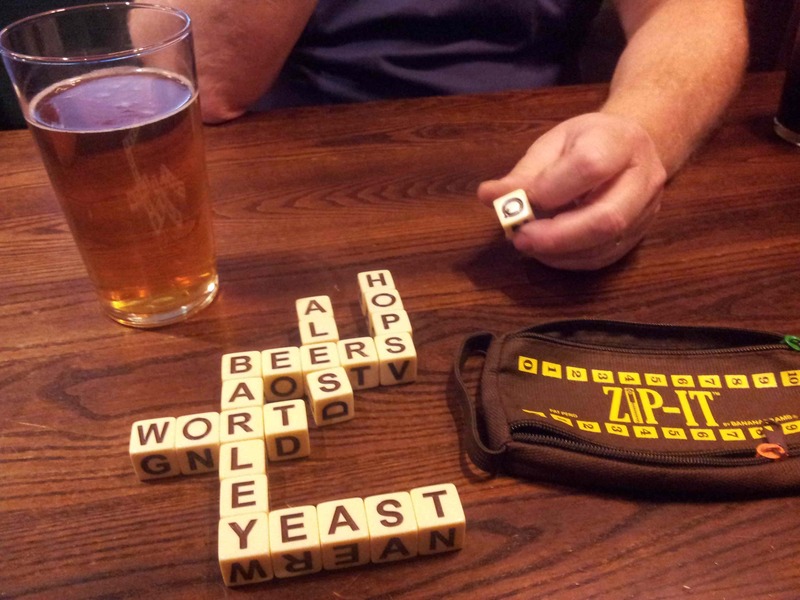 Zip It game review So, as I was saying… Beer Husband and I like a pub game. We’ll often play pool if there is a table but don’t play Chess much anymore – and being a journalist I much prefer a word game. Zip It is just that. A fast word game where players compete by making crossword-like grids of words from 12 cubes with letters on each side. You can use any side of the cube, not just the one that’s face up, and the idea is to put your words down as quickly as possible as the first to complete their crossword grid using all their cubes wins. It is called Zip It because of the pouch that holds the 24 cubes (12 for each player). It has two zips which as well as being fasteners double as a way of keeping score. You move your zip up a number each time you win a round and the first to 10 wins the game. It’s a very simple game and you don’t necessarily have to be a wonderful wordsmith to win. Nimble fingers are as important as the ability to quickly spot potential words among your letters. Beer Husband and I both enjoyed playing it (but it made us very competitive!) and he went as far as to say that every pub should have five Zip Its behind the bar that people could take out in return for a deposit. As well as being fun, quick and easy to play the Zip It pouch was small enough to easily fit in my handbag or Beer Husband’s coat pocket but with the bonus of decent sized cubes rather than the tiny, fiddly pieces some pocket games have. Yes, I set those words up for the picture! I’m not sure about the manufacturer’s claims that it’s good for playing on aeroplanes, but it is definitely a good bet for the pub. Just make sure to put your beer out of the way to avoid potential pint spillage as your furiously assemble your words in time to beat your opponent. ZIP-IT costs £14.99 and is available to buy from all good book and toy stores on the High Street or online. *What were we drinking? In case you’re wondering what the pints in the second Zip It picture are… I had Thwaites Wainwright (4.1%) which had an opening hit of citrus hops that somewhat disappointingly waned the more I drank; and Beer Husband had bottled Exmoor Beast (6.6%) a chocolatey porter with a bitter edge that would be SO MUCH BETTER if it was in a brown glass bottle as I always detect an armpitty, lightstruck edge to it. Great post! I always like to read about people playing games in public spaces.